Surprisingly, hits are hard to come by in the thriller movie genre in Tamil, so, any noteworthy attempt deserves to be appreciated. SM Vasanth's Satham Podathey is one such attempt. Of all the directors and actors who have inherited his style of filmmaking from K Balachander, Vasanth is among the foremost. The director has delivered films that have both surprised and pleased audiences. Satham Podathey is a worthy addition to Vasanth's cannon of films. One of the difficult things to achieve in the thriller genre is the ability to deliver twists in the plot at regular intervals. Vasanth's script, which is based on a true story, neatly delivers this without ever appearing to be contrived. Also, because this is a dramatic version of a true story, it is utterly free of the heroics usually associated with Tamil movies. Nithin Satya [Images], who debuted in the recent Chennai 600028, gives a strong, restrained performance as a psychopath. He plays Ratnavelu, an impotent alcoholic, who marries Bhanu (Padmapriya) without informing her or her family of his condition. When Bhanu finds out, she doesn't leave him immediately. She believes that Ratnavelu too didn't know he was impotent till after their marriage. She also doesn't realise that he is an alcoholic. By the time she divorces him and marries Ravichandran played by Prithviraj, it's quite clear that Ratnavelu is a psychopath. You can guess the rest of the plot. Ratnavelu returns to take revenge on his former wife. This forms most of the film's weaker second half. The first half, especially the long chain of events leading up to Bhanu's divorce, is unconventional. The turn of events have the ring of truth to them. However, immediately after the interval, he saddles us with two songs -- both item numbers -- that have nothing to do with any of the primary characters. Padmapriya walks through her role with the carefulness of a trapeze artist. Her character Bhanu's life is full of strange events and it's a testimonial to the actress's ability that she retains our sympathy all through the role. 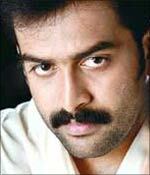 Prithviraj is at ease in the comedy scenes. His character's brief romance with Bhanu is like a breath of fresh air in what is otherwise a tense movie. Debutant Dinesh Kumar, much to his credit, isn't a very flamboyant cinematographer. I, particularly liked his composition of the house that plays the central role in the second half. The swing of the camera as the psychopath Ratnavelu oscillates between a pretence of innocence and downright villainy is a nice touch. Yuvan Shankar Raja's songs, which have already become familiar on the airwaves, are better than his background score. At certain points in the movie when suspense is quiet high, Yuvan just clutters his background score with wild vocals and loud rhythms. A note of caution, though. Be prepared for a bit of melodrama and the ghost of Balachander.